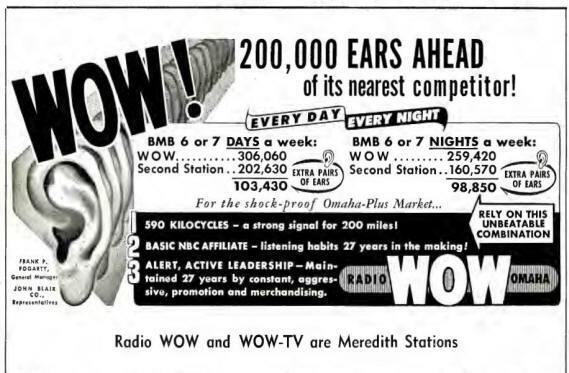 In 1949, Todd Storz purchased a daytime station in Omaha, Nebraska. 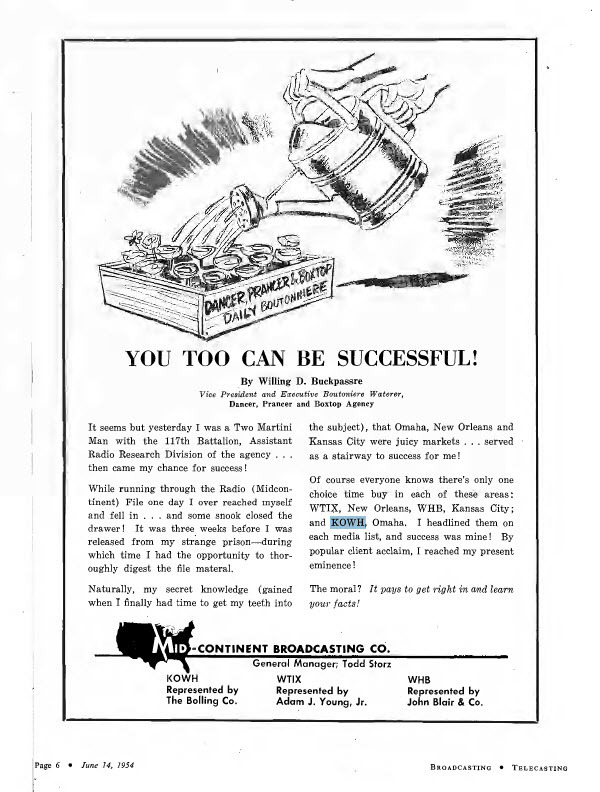 At the time, block programs and network entertainment shows were the norm for successful radio and music was a fill or part of a variety show. The use of recorded music was severely restricted by the American Federation of Musicians. The control of the AFM declined rapidly as the 50's began, and requirements to have station musicians was soon eliminated. 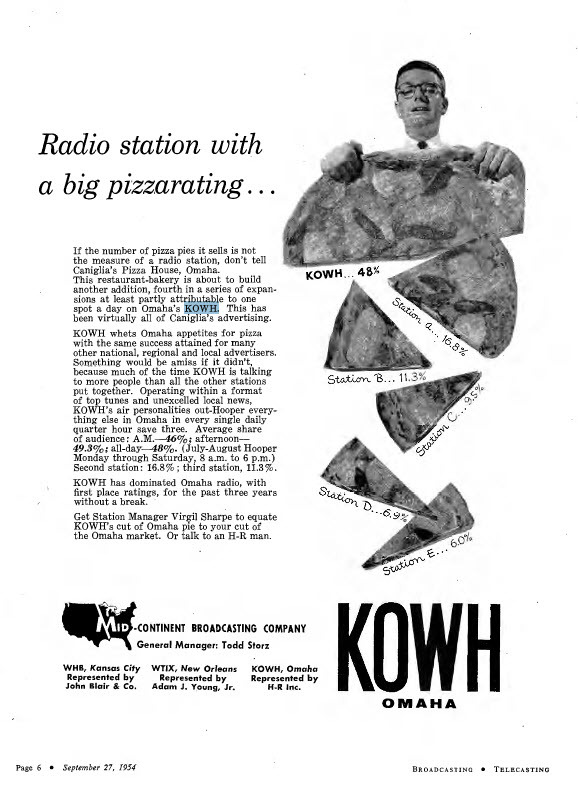 The background is sometimes fuzzy, with different story lines, but the fact is clear that KOWH was the first station to base its programming exclusively on the top hits of the moment, with no other programming breaking up the constant rotation of the same few dozen songs. 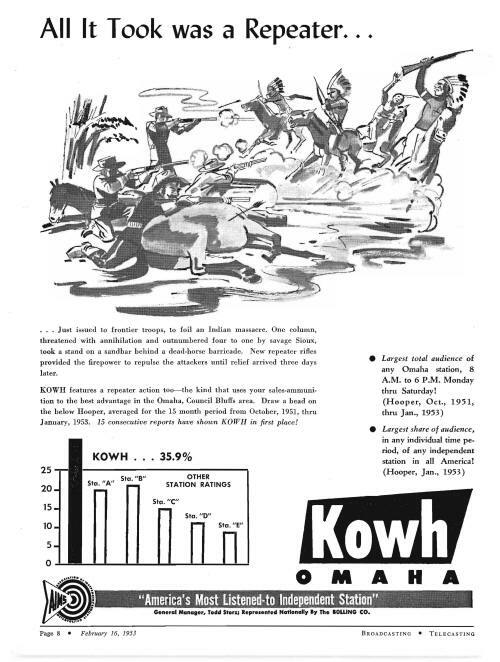 In 1951, the leader was WOW, followed by KFAB. 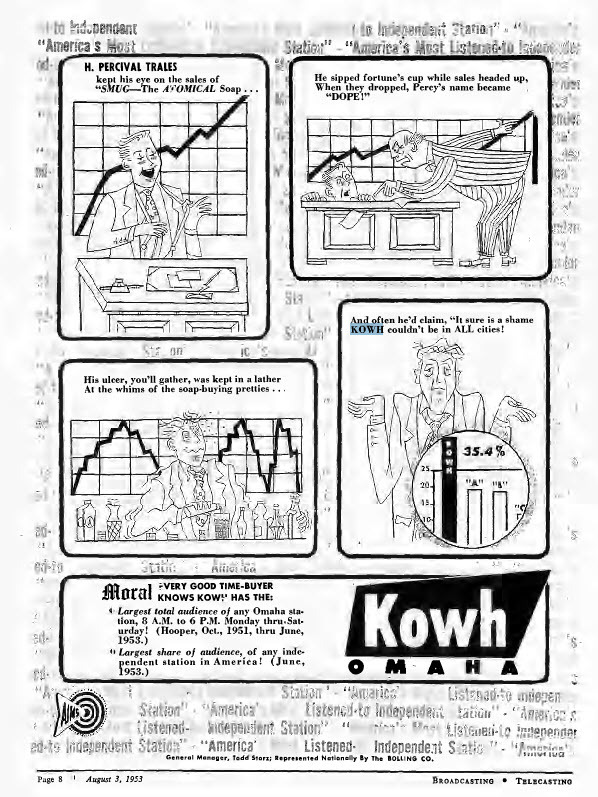 This ad from the Broadcasting Yearbook from the edition prior to the debut of KOWH as a Top 40 station shows how the market looked "before Top 40." 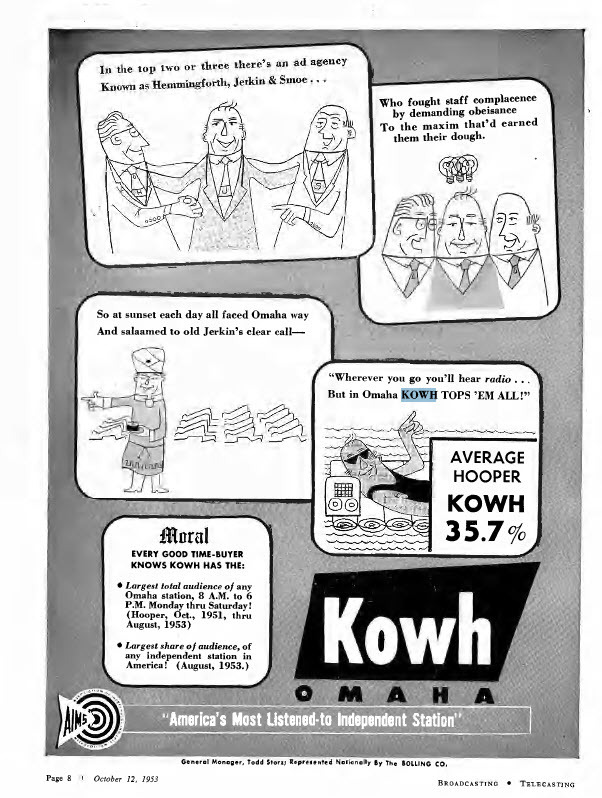 Here is an ad from the next year's edition of the Yearbook with KOWH taking the crown for most listening. Not only was this an amazing feat, it is all the more interesting because KOWH only operated from sunrise to sunset. The ratings continued to hold for another year. This is from the 1954 Broadcasting Yearbook edition. Some say that Storz commissioned a study at a local university, others say that he saw an already finished study. But the study, whoever paid for it, said that people, at the dawn of the television era, listened to the radio in their majority to hear music. Storz' own anecdotal experience showed that people liked to hear the same "big songs" over and over. One version of that experience has him observing juke box play and noting that the same few songs got most of the play. Your webmaster for this site was 18 in 1964 and was building South America's first Top 40 station in Quito, Ecuador. On an April 10 layover in Miami when returning from an equipment buying trip, I visited WQAM and was introduced to Todd Storz. He gave me several hours of friendly instruction in how to do Top 40 right; what he told me worked and my station debuted at #1. So in my mind, there is no question about Mr. Storz' authenticity, knowledge and genius. Todd Storz died of a stroke just two days after I met him. 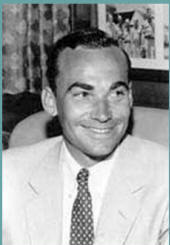 Richard Fatherly, who passed in 2011, worked with Todd Storz. He later produced several narratives about the Storz stations. In correspondence, Mr. Fatherly furthered my anecdotal knowledge of the Storz story and provided me with the following MP3 audio files. 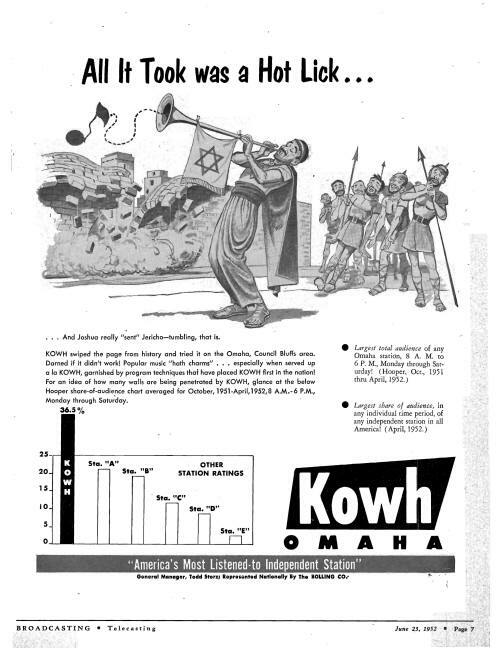 So, at some moment in or around about August of 1951 KOWH became the first all current hits station. Among the early Top 40 stations was KLIF in Dallas, where Gordon McLendon launched his own broadcast empire. 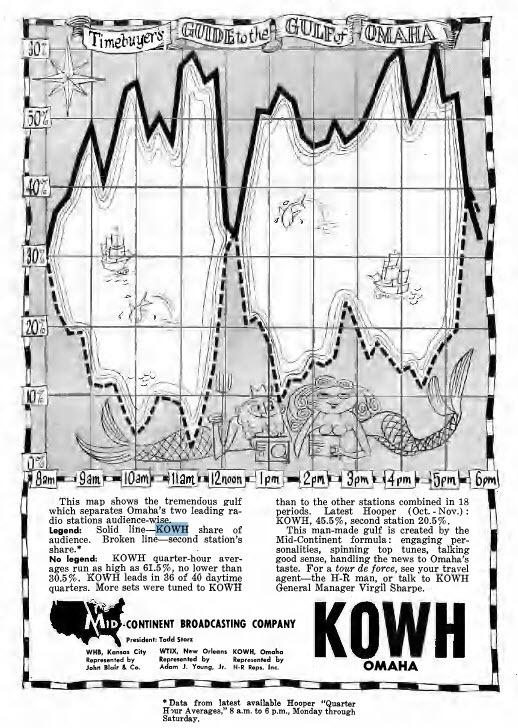 Rather than narrate the much discussed creative process behind KOWH, I thought it would be more interesting to show what happened after the format made it through its first ratings book. 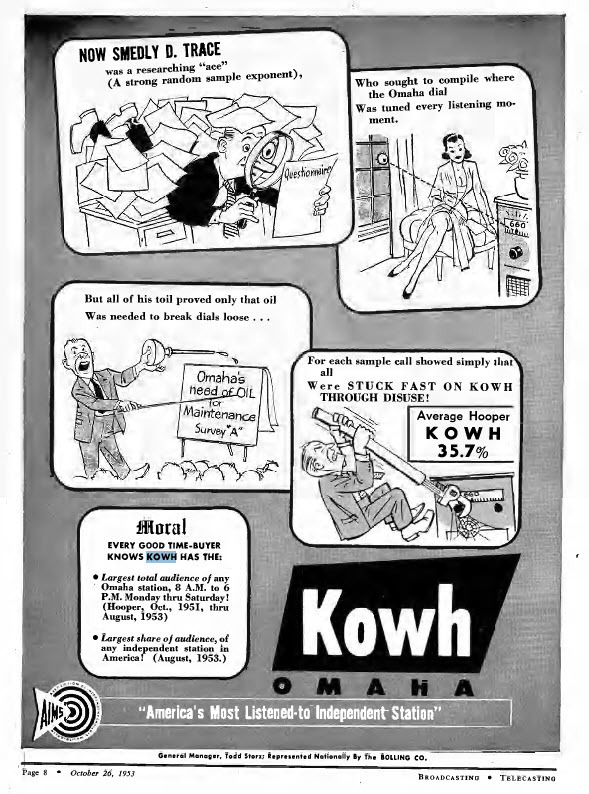 Here are some of the early ads... starting in February, 1953 just a month after the first full year of ratings was released. 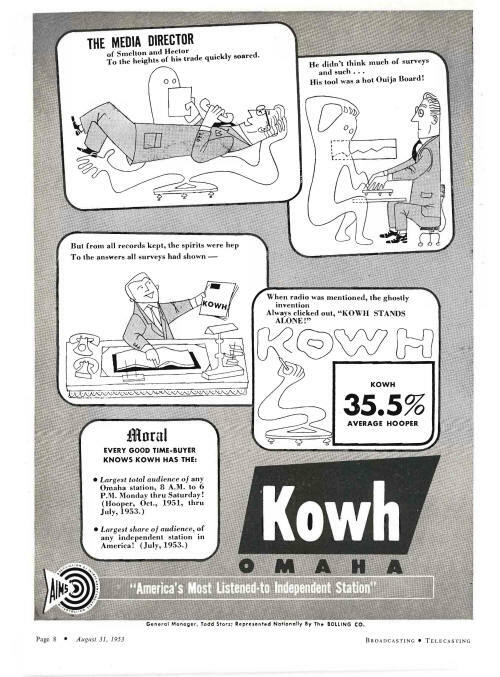 A series of similarly themed ads followed, and here are some from 1952 to 1955. Click on any of them to see a larger version. There are "hidden" mouse-over forward and back arrows on the right and left that are activated by mousing over them. 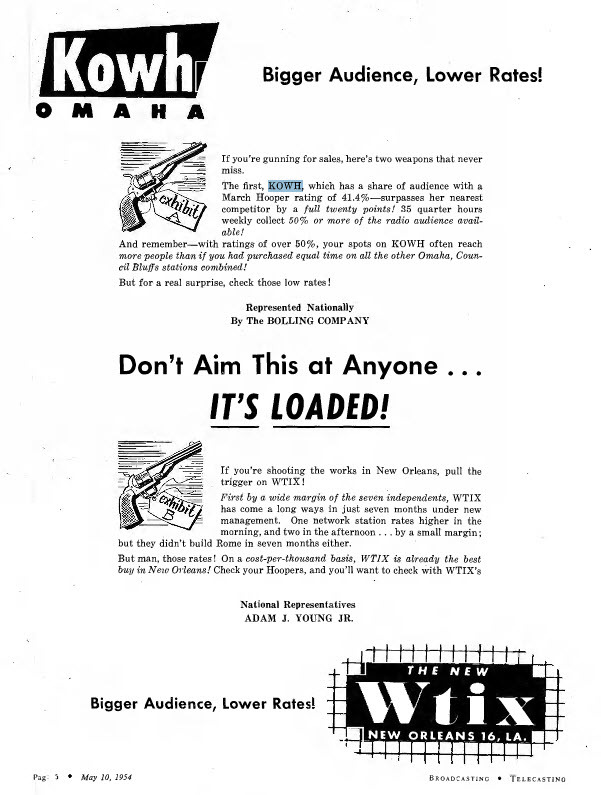 By 1954, WTIX in New Orleans and WHB in Kansas City had been added but the theme was the same. 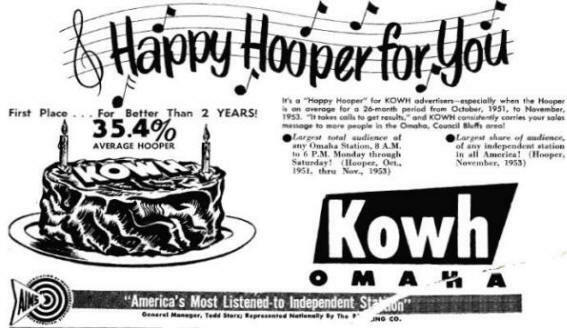 There are many more ads and they later feature additional stations like WQAM, KXOK and WDGY and KOMA that were added to the group. To demonstrate the search feature of this website, here is a link to a search that will give you several hundred KOWH references. Click on the picture of Mr. Storz to see them.